Social Subordinate Service, Tribal Subordinate Service through online examination. Online application submission last date for this APPSC Hostel Welfare Officer, Assistant Welfare Officer Posts Examination is 20-03-2019. 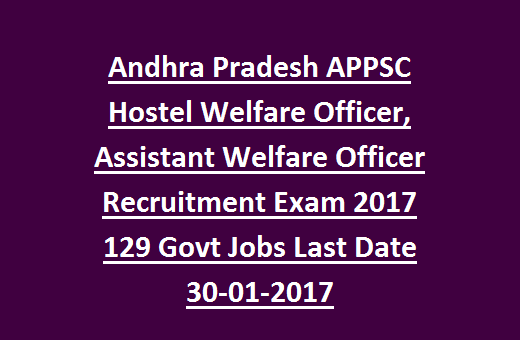 The selection for Andhra Pradesh PSC Hostel Welfare Officer Jobs Recruitment 2019 will be based on Screening Test (If more than 25000 applications) and computer based online test followed by personal interview. Online applications only accepted through Andhra Pradesh PSC web portal at http://psc.ap.gov.in. For applying online candidate must have obtain the OTPR One Time Profile Registration using APPSC website. APPSC Hostel Welfare Officer Jobs eligibility, exam pattern and syllabus, pay scale, important date and more data is given below. These vacancies are for both male and female candidates. Click here for notification of Andhra Pradesh BC Hostel Welfare Officer Jobs Recruitment Exam. There are total 129 vacancies available in AP BC/Social/Tribal Welfare Subordinate Service. Must have qualified any one degree from a recognized university. For general candidates Lower age limit is 18 years and upper age limit is 42 years. For SC/ST/BC candidate's 5 years of upper age relaxation is given. Selection process for this AP BC/Social/Tribal welfare subordinate services jobs recruitment will be held through screening test(If>25000 applications) and Computer based online exam followed by interview. For the candidates of General exam fee is Rs.80/- and application fee is Rs.250/- and for SC/ST/BC candidates application fees is Rs.250/-. No exam fee for reserved candidates. 2. Mains Test Consists of two different papers of objective type. For each wrong answer 0.33 negative marks will be given. Mains Exam: Consists of 3 different papers. Click here to apply online for the APPSC BC Hostel Welfare Officer Recruitment Exam 2019. 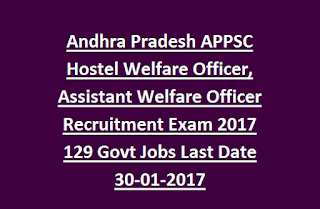 Please share this Andhra Pradesh Hostel Welfare Officer Recruitment 2019 article to your lovable friends through online via social web. Click here for notification of AP BC Assistant BC/Social/Tribal Welfare Officer Jobs Recruitment Exam. I am cheerful to discover this post Very valuable for me, as it contains part of data. I Always like to peruse The Quality and happy I discovered this thing in you post.